Mathieu van der Poel is finally emerging from another layoff due to knee injury. Cyclocross needs him, as does his key rival Wout Van Aert. The 21-year-old former cyclocross world champion wants you to know he’s not worried. A year after missing almost half the ‘cross season after multiple surgeries aimed at resolving a knee injury he sustained in a bad fall at Tour de l’Avenir, he is watching from the sidelines again. If you’re a cyclocross fan — or, more importantly, a fan of cyclocross being competitive — it’d be easy to worry. 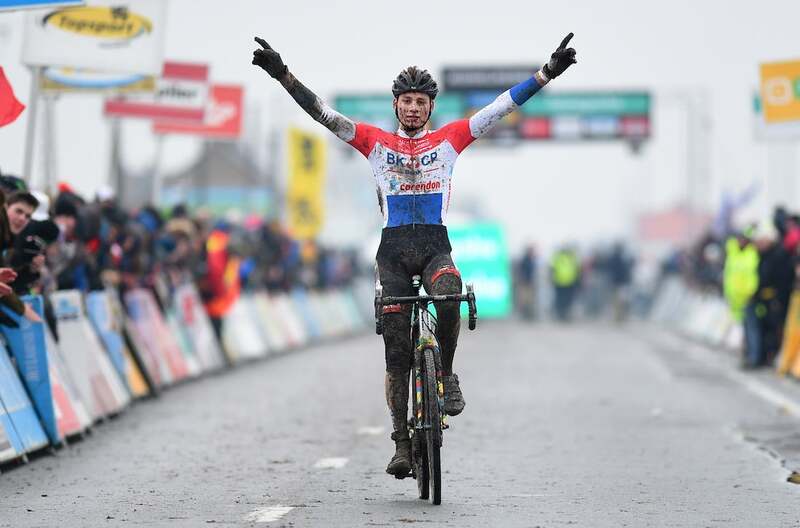 Mathieu van der Poel, son of 1996 world champion Adrie, and leader of the recently re-christened Beobank – Corendon team, is the only man proven capable of beating Wout Van Aert. 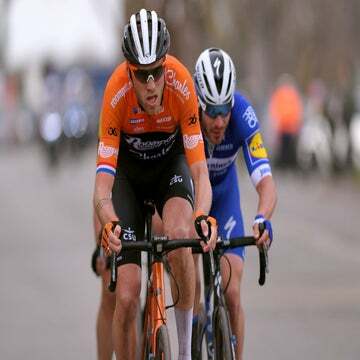 Van Aert, himself the reigning world and Belgian champion, won nine races during his Dutch rival’s absence last year and never finished worse than second place. If you want to see cyclocross become something more than the Van Aert show, you should be rooting for van der Poel’s recovery too. And he wants you to know, he’ll be back. In fact, van der Poel believes he has completely licked the injury that caused him so much trouble in 2015 before this latest bout of trouble. He stormed through the second part of the cyclocross season, all but sweeping the final month of races. Shaking off any lingering questions about how well he had recovered, he was even pursuing Olympic aspirations on the mountain bike. That bid fell apart thanks to the same bad luck that led to the sidelines this season. He jokes about it now. But, after a minor surgery and positive prognosis, he says there is nothing to worry about. No long-term implications, no concern about his ability to race. He will be back at it soon. Not soon enough for American fans, however. Van der Poel missed two World Cup stops in the United States, and will return only in time for the start of the Superprestige series, at home in the Netherlands, in Gieten on October 2. On the other hand, that doesn’t mean he has to like it. One thing he learned last season is how long it takes to catch up with the sport after a long layoff. He will still be deep in training when he makes his return, while his competitors will already be in full race mode, and he is prepared for a long, slow build back to the top of the sport. 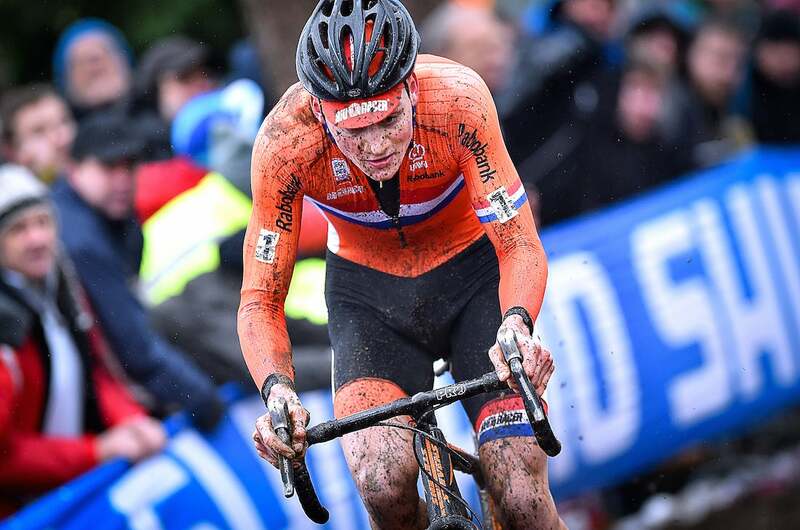 Meanwhile, van der Poel may not be worried about his condition, but others in the sport are. Sven Nys, now team leader for the Telenet – Fidea Lions, worries that thanks to his injuries, van der Poel is not progressing. Niels Albert, two-time world champion who now serves as Van Aert’s Crelan – Vastgoedservice team director, says much the same thing. 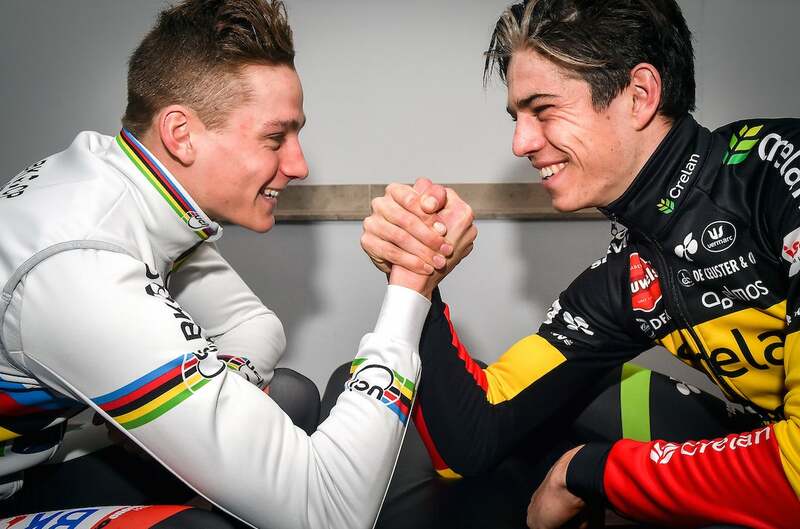 In an interview with the Belgian website Veldritkrant.be last month, Van Aert himself said he was eagerly awaiting van der Poel’s return. Van Aert knows well what happens when one rider dominates the sport. His run of successes early last season set fan expectations sky high, but left his own motivation flagging. He, like van der Poel, is a competitor; he thrives on the battle as much as the win. In the absence of another serious contender — and there are undoubtedly a few riders aspiring to a place near the top of the sport, Michael Vanthourenhout and Laurens Sweeck, for example — van der Poel is the only man who can elevate the competition on which Van Aert thrives. And indeed, the two seem to be inextricably linked. 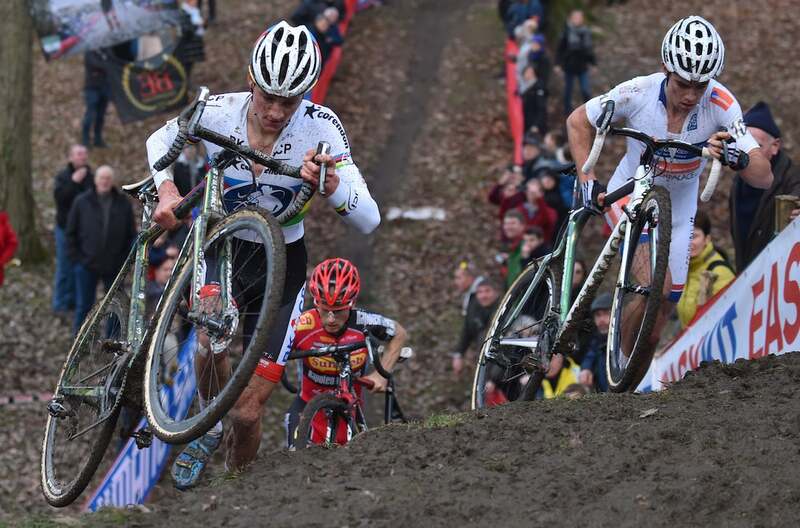 Both riders came to the forefront in the wake of Sven Nys’s disastrous 2014–15 season. Nys long dominated the sport, but by November of that season had fallen apart in the wake of a divorce and excessive training. Van Aert, then the under-23 world champion, and van der Poel, also a U23 rider, both dipped their toes in the waters — or mud, maybe — of elite racing that year. In spite of being just 19 at the time, the pair emerged as the top riders in the sport more or less simultaneously. By the end of the season both young men had foregone their eligibility for developmental races, and instead battled to a dramatic finish in the elite 2015 world championship race in Tabor, Czech Republic. It was van der Poel who earned the first set of rainbow stripes as a professional. Van Aert followed a year later, in Zolder, Belgium. 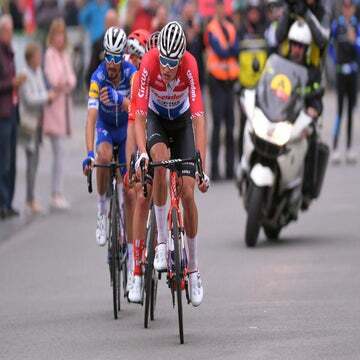 But the battle fans expected fizzled toward the halfway point of the race when van der Poel and Van Aert became entangled on a tricky off-camber corner. Van der Poel lost close to 30 seconds and did not recover. Van Aert, miraculously, regained the front of the race. Van der Poel says now he doesn’t know if he could have won a second world title that day, or even if he could have delivered a real duel. Things would have been different without the bobble, but he is looking forward, not back, he says. He knows there will be many more duels with Van Aert. But everybody is an important rival, he adds. He names Sweeck and Vanthourenhout as important — and dangerous — rising stars. And he says he shares a connection with Belgian rider Klaas Vantornout, who he considers a friend. “We both have a passion for sports cars,” van der Poel says. “That gives us something to talk about.” Vantornout, a two-time Belgian champion, known for reserve away from the bike and his ferocity on it, was one of van der Poel’s biggest supporters during his injury last season. Meanwhile, Mathieu van der Poel has been focused on carving out his own identity. He is not just the son of a racing legend, but the grandson as well of Raymond Poulidor, an eight-time Tour de France podium finisher and one-time Vuelta a España winner. He jokes now, about how much advice his dad gives him and how much of it he ignores. He laughs about the universality of parents who continue to act like parents long after their children consider themselves grown. “I think that’s the same in every family,” he says. Maybe, but not every family has fatherly advice that flows from one world champion to another. For a kid who has seemed destined for cyclocross greatness his entire life, van der Poel seems remarkably normal, grounded. He talks about racing with maturity and poise — says he always races to win, because that’s what the fans expect. It’s never been a better time to be a cyclocross fan. And you can thank Mathieu van der Poel for that. And, in Gieten he’ll remind you why that is. He talks about his fellow riders, thoughtfully. Says he thinks the American World Cups are good for the sport, but hard on the teams who foot the travel bill, and he would prefer to invest in attracting a more international field to races in Belgium. Genuinely, he seems to care about the sport and recognizes his responsibility, as a former world champion, to be an advocate and ambassador for it. At 21 he really is still just a kid, but, entering his third year as an elite, he is poised and professional, a veteran. When Nys announced his impending retirement a few years ago, there were murmurs of worry. Nys is a singular figure, the most prominent and successful racer in the sport’s history. At the height of his career, his presence alone could determine the financial success (or not) of a race. Now Nys is gone, busy with a new career as leader of the Telenet – Fidea squad, but the sport has never looked better. In Van Aert Belgium has a champion and likely successor to Nys. In van der Poel, the Dutch have a perfect counterpoint, their own champion, a skillful and crafty rider, to help restore balance to one of the great international rivalries in cyclocross. Still young, the pair could dominate for another 15 years, even if they can’t match the longevity of Nys’s incomparable career.